Seal Any Holes that You Find – Skunks like to burrow in areas of your house that may be difficult to find. It is important to know that several places under the house, deck, and yard could be grounds for a skunk to create a living space. The best tools to use when covering any possible holes or potential hiding spaces include solid metal flash wire and screening. Keep Your Garbage Safe – Any garbage lying around in your yard could be grounds for a habitat for skunks. It is important to keep garbage in a covered bin so that skunks will not be attracted to the smell. This will not only keep your yard and garage area looking nice and clean, but skunks will have a harder time calling your place their home. Use Repellents – There are many ways to keep skunks at bay. Some of the most common home remedies include water infused with boiled cayenne pepper, onions, and jalapeno peppers that can be sprayed on skunks. However, if you do not have a lot of time, or you do not have these products, then some other repellents include mothballs, ammonia-soaked rags, and peppermint. Skunks are not fun to have around your house. We hope that these tips will work well for you and help you enjoy your fall a little more. We understand that you have worked hard to maintain a clean home, and we also understand that you do not want your house to smell like a skunk. 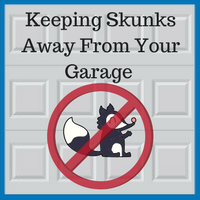 If you are having problems with skunks invading your garage, or if you have any further questions, please contact us at 630-852-8485. If you would like to see what types of garages we have built, please check out our gallery.